Written for intermediate Python programmers, this excellent tutorial will help streamline your work through the use of Design Patterns. You'll learn through example and clear explanations to expand your know-how and speed up your output. Design pattern is a well-known approach to solve some specific problems which each software developer comes across during his work. Design patterns capture higher-level constructs that commonly appear in programs. If you know how to implement the design pattern in one language, typically you will be able to port and use it in another object-oriented programming language. The choice of implementation language affects the use of design patterns. Naturally, some languages are more applicable for certain tasks than others. Each language has its own set of strengths and weaknesses. 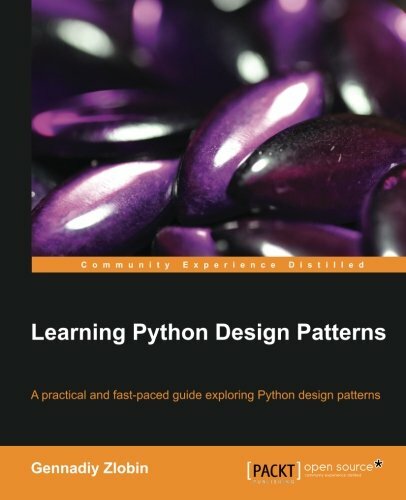 In this book, we introduce some of the better known design patterns in Python. You will learn when and how to use the design patterns, and implement a real-world example which you can run and examine by yourself. You will start with one of the most popular software architecture patterns which is the Model- View-Controller pattern. Then you will move on to learn about two creational design patterns which are Singleton and Factory, and two structural patterns which are Facade and Proxy. Finally, the book also explains three behavioural patterns which are Command, Observer, and Template. This book takes a tutorial-based and user-friendly approach to covering Python design patterns. Its concise presentation means that in a short space of time, you will get a good introduction to various design patterns. If you are an intermediate level Python user, this book is for you. Prior knowledge of Python programming is essential. Some knowledge of UML is also required to understand the UML diagrams which are used to describe some design patterns.